There is evidence that poverty and violence go hand-in-hand for a number of reasons. Those who are poor may come into friction with those who are not. Or the lack of wealth is systemic, learning to a poor public safety infrastructure. Or those who are poor do things deemed criminal by society in order to survive. 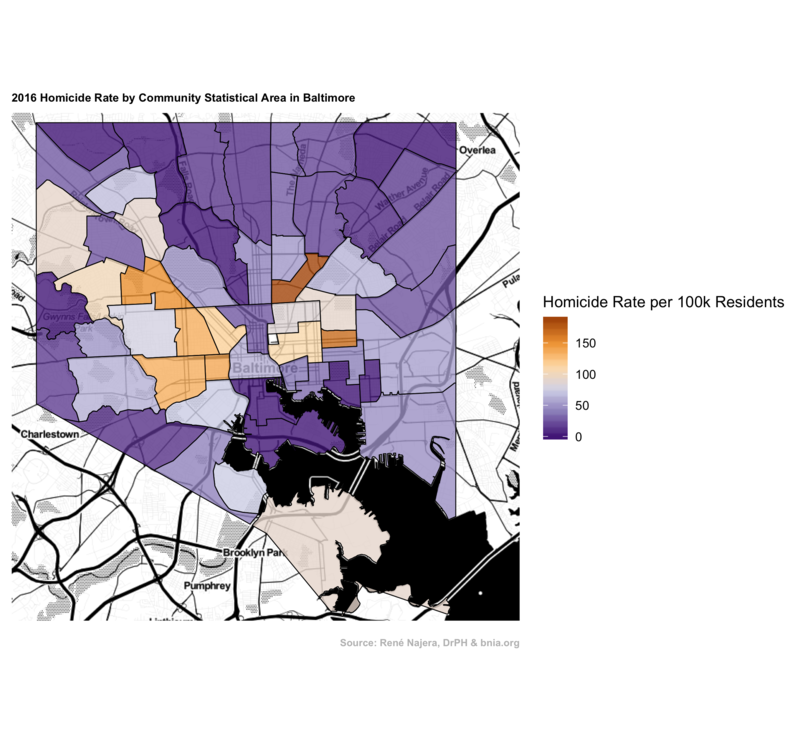 In this project, I take data from Baltimore on homicides in 2016 and data from the Baltimore Neighborhood Indicators Alliance and see if homicides were inequitably distributed in Baltimore. For my doctoral dissertation, I received a list of homicide cases from Justin Fenton at The Baltimore Sun. That list contained the names, locations, and some demographic (age, gender, race) information on homicides reported in Baltimore between 2005 and 2016. I added to those data the same data that I had collected from 2017. In order to validate the dataset, I randomly pulled 400 cases and searched for news archives, obituaries, and official sources to confirm them. All 400 cases were confirmed this way. I then geocoded these data to get the latitude and longitude of the incident location through ArcGIS. The information on the Community Statistical Areas (CSA) came from the Baltimore Neighborhood Indicators Alliance. BNIA collects and cleans data about Baltimore every year. For this project, I’ve used their Vital Signs 16 data, which you can explore. I obtained the percent of households under the poverty level by (CSA). All of the data and code that you need for this project are in the project’s GitHub repository. The R code has all the comments you’ll need to understand what is happening in each line of code, as well as the questions that we will be answering below. Alternatively, you can download the zip file with all the code and data. 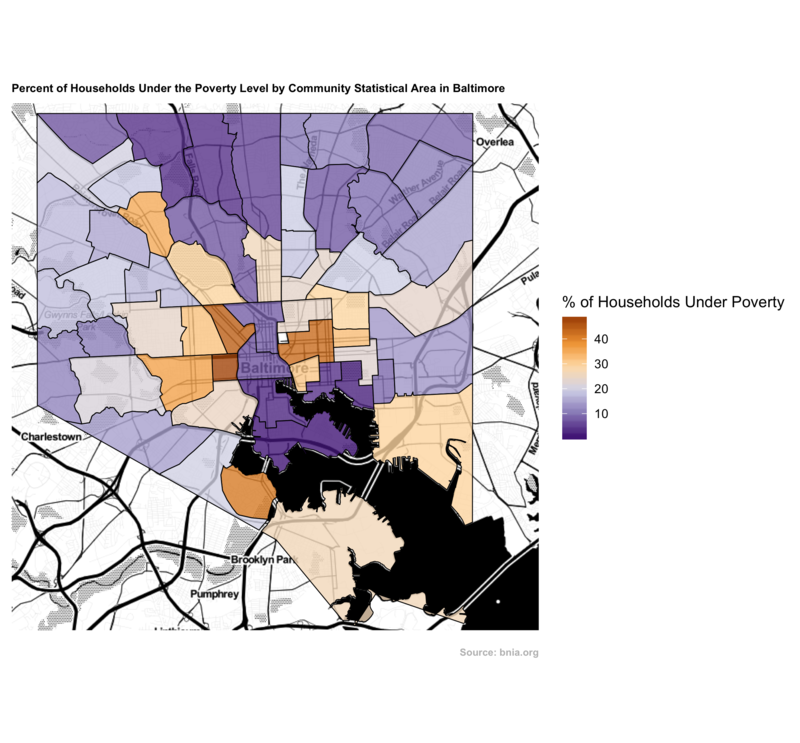 The main aim of this project is to give Public Health professionals a primer on using R programming to determine if a health indicator (homicides, in this case) is equitably distributed in a location (Baltimore) according to that location’s indicator of wealth (percent of households under the poverty level, in this case). Here is a quick YouTube video I made of me running the code on RStudio. It’s 15 minutes, and you can see how easy it is to look at the code, run it, and the understand what each line did. Step One: Are Homicides and Poverty Distributed in a Spatially Similar Way in Baltimore? For this first part, we bring in all the data of homicides from 2005 to 2017. I’ve already geocoded these data. If it only had street addresses (at the block level) of homicides, they would need to be geocoded into latitude-longitude coordinates. But that’s for a different project at a different time. What is also included in the dataset are the names of the Community Statistical Areas (CSA) they belong to. CSAs are a way to bring together neighborhoods into bigger areas while maintaining as much as possible of the neighborhoods’ geographic and sociodemographic characteristics. # Read the homicides between 2005 and 2017 into a dataframe. # Since we're using 2016 CSA data, we'll only use 2016 homicides. # cleaned up by the author for work in his doctoral (DrPH) dissertation. How many homicides were reported in 2016? Now we’re ready to bring in a shapefile from BNIA which contains the shape of the CSAs in Baltimore for mapping purposes. Because R needs to deal with this as a dataframe, we transform the shapefile into a dataframe. Which CSA had the highest number of homicides reported in 2016? Now, we’re going to bring in BNIA data on population and percent of households under the poverty line. We will then join that information with the homicide counts we just created. We then save the data for later use. # to the information by CSA. type = "right") # Joins the data to the homicide per CSA table. # There will be some NAs because some CSAs did not have homicides. # Some of the CSAs did not have homicides.So we need to turn those into zeroes. # It prevent's NAs in the next step, calculating the homicide rate. Which CSA had the highest homicide rate per 100,000 residents reported in 2016? You’ve probably seen choropleth maps before. They’re those maps where the shading of a geographic unit (e.g. a US State) depends on the value of some variable (e.g. Population). For this exercise, we’re going to make two choropleth maps: One showing the percent of households under the poverty level by CSA in Baltimore (based off the Vital Signs 16 data), and one showing the homicide rate per 100,000 residents we just calculated above from the homicide data and the population per CSA from BNIA. For this, we will join the homicide counts, rates, and percent poverty to the CSA shapefile, then make the map using ggmap. Look at the code that customizes the map. The neat thing about doing this in code is that you don’t have to remember which buttons you clicked if you want to reproduce your work. 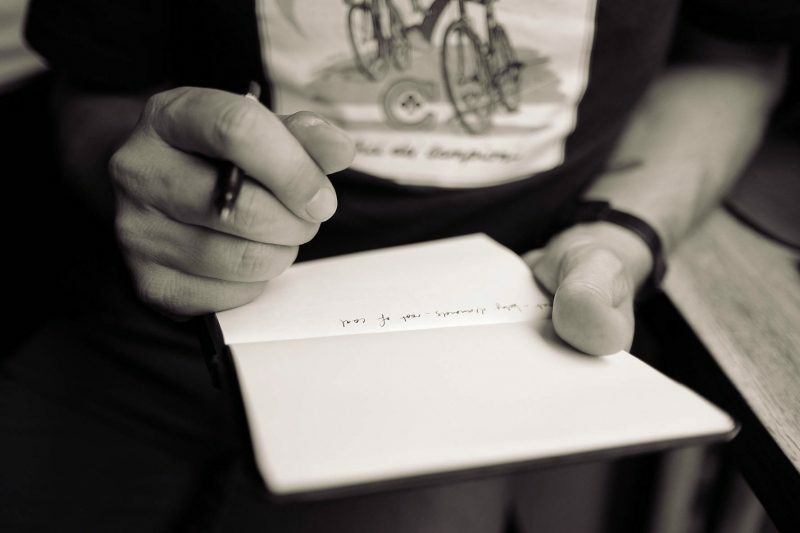 If you use a graphic user interface (GUI), or point-and-click, you might forget how you did something. Here, it’s all in code, with comments and such, ready for you to plug in your data, tweak a few things in the code to fit your needs, and output something you can use. palette = "PuOr",  # Gives a nice scale. na.value = "transparent") +  # There should not be any NAs, right? Yes, there are other ways to create a map in R, but this is a very “robust” way that allows you a lot of customization. Another package is Leaflet , but we will leave that for another project at a later time. # Just like the choropleth above, but with homicide rate as the filler. fill = homicide_rate), # Fill by "homicide_rate" instead of "poverty"
The next few lines of code will show you the maps side-by-side. # Save the side-by-side to a file for viewing later, or editing, etc. Does there seem to be an association between poverty and homicides? There does seem to be, at the very least, a spatial association between poverty and homicide rate in Baltimore in 2016. That is, the CSAs with higher homicide rates also seem to be the ones with the higher percent of households under the poverty level. But let’s look at it in a scattergram to see this association a little more mathematically. # Now, a simple scatterplot. What does this tell you? First, let’s process the data. # There are 55 CSAs, divide by 100 to turn to percentage (decimal). Why the 319? Now, let’s plot it using ggplot2. So what does the curve tell you? Can you answer the questions below? Are homicides distributed equitably in Baltimore? How many CSAs had 50% of the homicides in 2016? What percent of the total homicides in 2016 did the wealthiest 20 CSAs have in 2016? That is all for this project. Please feel free to use the code for your own needs, but do cite your data sources and give me a shout-out to let me know how you’re using it. If you have any questions, leave them below.